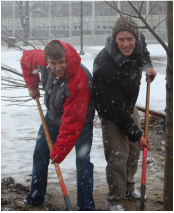 Since 2008, the Grounds Committee has led yearly (and sometimes twice-yearly) tree plantings. These planting have added 80 trees to the campus arboretum and enabled hundreds of students to experience the satisfaction of planting a tree. The Committee provides the leadership, expertise, organization and food for these tree plantings. With the important goal of increasing diversity of species, we have chosen linden, filbert, oak, crab apple, gingko, planetree, zelcova, katsura, beech, serviceberry, pinyon and ornamental pear and plum to add to the existing campus arboreteum. 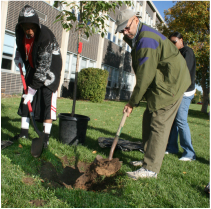 We understand, as community foresters, that planting a tree is just the first step to sustainability of an urban forest. In our Front Range plains climate, where only cottonwoods are native, young trees of other varieties must receive winter watering and supplemental summer watering in order to survive until adulthood. Therefore, the Committee sponsors a variety of measures to ensure the survival of young trees it has planted. Most importantly, the Committee has engaged the participation of the special education classes at GW, who conscientiously provide winter watering to the young trees when the school irrigation system is turned off from October until May. Without this care, the new trees would not survive our frequent winter dry spells. Throughout the summer the Committee pays students to fill “gator” bags on the new trees to keep them watered when grass irrigation must be limited by drought conditions. There are 225 trees on the GW campus. 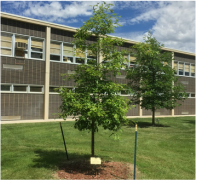 Recognizing the health, ecological and aesthetic importance of these trees to the school and neighboring community, the Community has created a schedule of all the trees on the campus so that they can be and monitored. We periodically survey all the trees for needed maintenance and conduct or supervise this care. Through a grant from Whole Foods, we installed a campus shed provided with equipment necessary for maintenance of the ornamental and productive fruit trees at the school. A number of families have honored their student with dedication of a tree and a donation to the work of the committee. We have also dedicated trees to two students who have died since 2007 while studying at GWHS - Amelia Bates and Eshaw Jackson. Click here to donate a tree.